With a 6am start, we were up early but with it being only a 5 minute drive over to the lake we we in no rush. During the evening there had been thunderstorms until the early hours of the morning but sunrise dawned to a beautiful morn with a promise of good weather ahead of us. We arrived at the camp in time for last minute preparations and walked over to the starting line. At the go signal, we headed off into the prairie on the dirt road at a relaxed pace with neither one of us feeling too confident of a good time,but just looking forward to finishing comfortably. Frank was with us and hoping to hang around for a while but as we made the first turn and up a little hill he dropped behind a little and that would be the end of that. We passed through the first mile in 9:37 feeling good and settled in for the long distance ahead. We hit mile 2 in 9:56, about what we were hoping to average for the day. The field for both races was small so we were already spread out quite a bit and it would just be the two of us alone to enjoy the sights around us. It was a little humid but otherwise felt great with the air around 59F and only a slight hint of the usual prairie wind. The course is comprised of two large loops in a figure 8 so we began making the first lap around the lake area. It is a pretty lake with some shaded areas and some small homes along the waterfront. Karla pointed out where she and her friends would lay out by the lake on what used to be a little beach area. As we came up one of the small hills to the 5 mile mark our paced had slowed to the 10:15 range. We still felt ok but both thought the effort seemed like we should be moving faster. Oh well, it was all for fun so we just moved along and hit the highway and headed into Viborg. It is about 2miles into town once you get onto Hwy 19. Very flat but also very little traffic. It is also one of the few paved parts of the course with most on smooth gravel roads that felt nice and soft from all the rain in the area recently. After passing quickly through the small town we were back into the farm land and another long straight dirt road. This one had a little mud but was easily avoidable. I was wearing new, mostly white shoes and they would still be mostly white by the end of the race. The road was straight as an arrow with a few gentle hills as we headed back to the lake to complete the first large loop. Already the pace was slowing to about 11 minute miles. I was feeling good but I could already tell Karla wasn't having one of her better days. I think this is the 7th marathon I have run with her as well as countless long training runs so I can easily tell when she isnt having a good day. I noticed some beautiful, fragrant lavender flowers growing by the road so I picked a small sprig and handed it to her hoping it would lift her spirits and she stuck them in the strap of her water bottle. Soon we passed the spot where the half- marathoners would turn to finish and I looked back and could just see Frank in the distance so we knew he was going to finish in about the time expected. We continued straight ahead and back to the lake somewhat frustrated that the pace was slowing with each mile. After a while we reached the mile 16 aid station where Karla's Mom and Aunt Ginny were volunteering. We spent a couple of minutes there before moving on. By then it was evident that it was not a good day for the Princess. I was feeling good but at the pace we were moving I should have. Time was not important to me though so I stayed with her and just tried to keep her spirits up as much as I could. But by mile 18 the fatigue was too much and she started walking. At that point we made the decision to just get to the end with as little stress as possible. The next several miles would pass slowly but we used the slow pace to get in some bird watching as well as admiring the flowers along the marshes. As we continued the run- walk , we saw lots of redwing blackbirds and several beautiful birds that neither of us remembered ever seeing before with a yellow head and big white spots on it's wings. I tried to get some pictures and hope they turn out ok.( a look in Carmen's bird book showed it to be a yellow headed Blackbird ). By mile 24 she decided she just didn't want to run anymore so we walked the last two miles. It was a beautiful day for a walk and only reached 72F for the day. A nice morning for two friends to share a walk around the lake. Too bad we were suppose to be running a marathon. It's time to re-group for both of us now but I was encouraged that my legs felt a lot better than they have in a long time. Hopefully I have turned the corner and good times are ahead. The race itself is a nice one. A certified course in a lovely small town prairie setting. Plenty of aid along the course and good food at the finish. Not the place to come if you need cheering crowds but if you like a small, well organized race this is a good one to give you an excuse to check out South Dakota. I was the pitifully slow guy who finally passed you two at mile 24 when you started walking the rest of the way. Swan Lake really did a nice job of putting on a small marathon, didn't they? I am sorry I didn't get a chance to talk with you at all. Everyone I met down there was very nice. Funny thing seeing your blog and pictures. 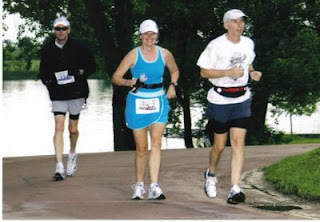 I was down there because I had a very bad day at the Fargo Marathon, and ended up dropping out so I could focus on my daughter's kids run later in the afternoon instead. 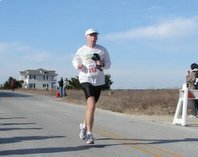 It was my first attempt at a marathon, and I just couldn't let a DNF stand. So down to Swan Lake we went. I was obviously horribly slow, but at least I finished this time. Anyway, I took a look at your Fargo pictures, and when I saw you and Margo wearing your red running stuff, I knew I had been standing near you at the start. And lo and behold, there I am in two of your pictures. Orange shirt, #1461 (Bill). Hope you come to Fargo again. That kind of extereme wind won't always be there on race day. And we love having you all here.